In the words of Swedish director Ingmar Bergman, “Tarkovsky for me is the greatest, the one who invented a new language, true to the nature of film, as it captures life as a reflection, life as a dream.” Needless to say, Russian director Andrei Tarkovsky is considered to be one of the most prolific and leading filmmakers in cinema history. Through film, the late Soviet director is known for shaping and molding metaphysical themes, mainly man’s relation to the environment, encompassing time, nature, and dreams. In the span of roughly 25 years, Tarkovsky directed seven feature films, all of which cover a variety of genres that include war dramas, biographical historical, science fiction. Yet, all of them overflow with themes and recurrent motifs such as self-reflective characters, forms of running water, burning houses, apparitions from memory, and spiritual symbolism that includes horses, paintings, and levitations. 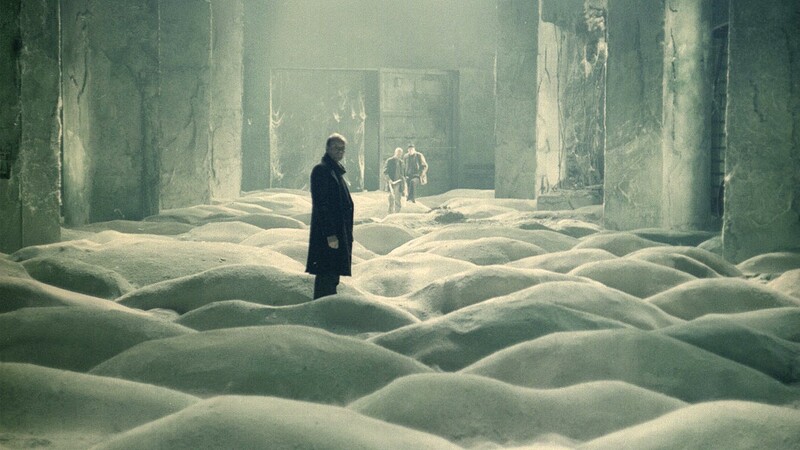 Given Tarkovsky’s stature as a filmmaker as well as his quality consistent craftsmanship, this is not as much a list of the best scenes from his films, much less in ranking order, as it is a selection of those scenes whose composition in theme, technique, cinematography, score, and narrative development best represents the late Russian director’s oeuvre. Each scene will be briefly discussed in terms of context, technique, and significance. Without further ado, below are the best scenes from Tarkovsky’s filmography. In his feature film debut, “Ivan’s Childhood”, Tarkovsky’s exploration of the emotional trauma, dark passions, and claustrophobic atmosphere war brings to those it touches are in full display in the Nazi Uniform scene. This sequence puts the viewer through the tribulations of the grief-stricken eponymous boy’s subjective reality – Ivan’s perception of the war torn environment – that overlaps childhood with militia, and reality with escapism. Imagining himself in the extraction operation of a Nazi perpetrator, Ivan crawls on the ground as if he was a soldier dragging his body through dismal trenches behind enemy lines. Ivan’s absorption in his fantasia intensifies when the camera switches to what is apparently his point-of-view, if not an accurate representation of him. The camera swings sporadically, mirroring the movements of Ivan’s flashlight, whose trauma is materialized in the sightings of his deceased mother, a dying boy, and Ivan’s terrified self. Together with the non-diegetic German radio calls – chanting, weeping and screaming – the scene reaches the climax of the film. The rapid motions and overbearing radio calls end abruptly and Ivan’s tension-driven fantasy quickly dissipates to its core moment: Ivan’s encounter with the “Nazi perpetrator,” which is actually a hanging uniform. Initially, Ivan reproaches the supposed fascist, but his spiteful expression gradually turns to one of sorrow. Ultimately, the hanging uniform stands as an allegory for the inner confrontation that comes with Ivan’s realization of the extent of his own suffering. Through this scene, Tarkovsky puts together a good case about the importance of rhythm – the crescendo or gradual increase of visual and sound elements, and the lack thereof – for the effect of the film’s context. 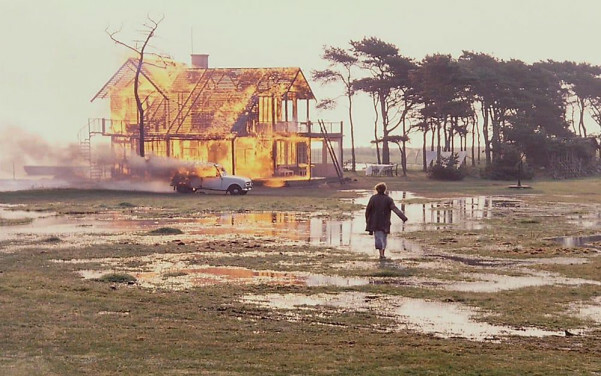 As appalling as it is thought provoking, the Burning of the House scene in Tarkovsky’s last film “The Sacrifice” displays the strongest qualities of the Tarkovskian long shot. Over five minutes long, this one-take long shot shows a family in turmoil after the father, Alexander (Erland Josephson), performs the titular sacrifice – setting their house on fire. The long shot exposes the event in a manner that inspires thoughts and questions. Additionally, this level of distance allow for the characters to be seen more realistically in their reactions. To effect, this approach calls into question whether or not Alexander’s lunacy is real, and to what purpose, and how his family, mainly his wife, feels toward him after he revealed his act. There is an apocalyptic notion as well as a deep sense of realism to this image. Working with Swedish cinematographer Sven Nykvist, Tarkovsky’s camera is didactic, always anchored, only panning to localize characters and never letting the house absent from the frame for too long. In terms of sound, the fire and the combustion of the woodwork overwhelms the family’s screams and shouts. In this manner, Tarkovsky creates the impression of an enclosed and confined space that, similar to the character’s ordeal, forces eyes to behold its catastrophic design. One might say that Tarkovsky documents a family tragedy in purely cinematic fashion. The last great scene in his filmmaking career, this prophetic imagery reflects ideas of radicalism, profound existentialism, and what could very well be an artist’s revolt at the rift of social change. 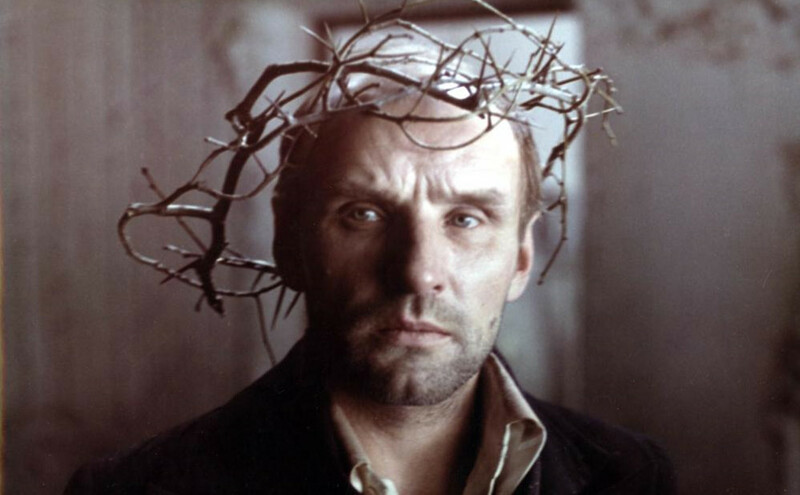 A traditional motif to Tarkovsky’s dialogue scenes is the Russian director’s tendency to frame the actors in a style that is evocative to portraiture and paintings. The elements for this effect – the actors’ choreography and composition, the contrast between shadows and highlights, the philosophical banter – are all never as calibrated as they are in the conversation between Rublev (Anatoly Solonitsyn) and Theophanes the Greek (Nikolai Sergeyev). Rather than the conventional mentor-apprentice relationship, Tarkovsky presents both iconic painters as two complex and fallible individuals, debating from opposite standpoints about the ignorance of man. The intensity and rhetorical demeanor Theophanes brings to the argument proves the perfect foil for Rublev’s passivity and uncertainty. Visually, Tarkovsky captures the moments of dominance, disbelief, and conflict in the argument through the coordination and juxtaposition of the actors’ bodies. Rublev’s powerful words about how Jesus’ relationship with his loved ones must have been, as well as the assertion that his crucifixion was an act of obedience to God, does not only defy the monastery’s doctrines but brings into perspective the idea that divinity, greatness, and glory are rooted in the machinations of an imperfect world. This monochromatic dream sequence derives its bizarre atmosphere from its dislocation of time and space. During his dream, a boy encounters his mother, Maria (Margarita Terekhova), in her nightgown, washing her hair and then pulling herself up from the water tub in slow motion. The droplets echo through the room, she stands with her soaked hair hanging, covering her face entirely, she then raises her arms to a rather ghastly position that loosely resembles a crucifix. The camera then pulls back before it cuts straight to a shot of same room, now empty and starting to fall apart. With the humming and the slow motion, there is a certain kinesthetic awareness as the ceiling’s plaster crumbles that somehow transcends time and calls attention to the texture and physicality of the affair. In effect, the event indicates the boy’s incapacity to understand or fully comprehend his parents as individuals who have fears, passions, and doubts. The rest of the scene unfolds through a camera pan revealing Maria’s mirror reflections and then, from her own perspective, a contemplation of herself as an old woman (Tarkovsky’s real mother, Maria Tarkovskaya). Regardless of whether it was the deconstruction of parenthood through sexuality, or the old woman’s reflection as both real and memory, or even if it was a tribute to his mother, Tarkovsky succeeds in internalizing his personal life to craft a multilayered representation of his mother that is nostalgic, thought provoking, and bizarrely cathartic. The “Meat Grinder” tunnel is the setting for the emotional climax for one of the main characters of the trio, Writer (Anatoli Solonitsyn), and perhaps the most tension-driven scene in “Stalker”. Instead of placing the viewer in a violent environment or a generated fantasy space, Tarkovsky builds tension by focusing solely on Writer’s ordeal through the “Meat Grinder”, a dark and miasmic industrial tunnel. Technically, this sequence delivers a sensorial experience through the camera’s close track of Writer’s movements and reactions that, accompanied by the diegetic sounds of droplets, echoes, and loud footsteps on dirt and puddles, provides a captivating immersive experience. The main room of the “Meat Grinder” is a vastly sand-covered space with an overhead light that highlights the outlines of the sand piles below it. From afar, the sand room casts the impression of a Caspar David Friedrich painting (particularly “Monk by Sea”) behind a mist of surrealism. A proud man, Writer delivers a bitter monologue confessing the frailty of his ego, man’s futility to change the world, and his frustration toward the work demands he faces as a writer. Distraught and battered, Writer stares directly at the camera as it slowly closes in, and reveals his humiliation for admitting his weaknesses as an individual and an artist. Similar as to when the Stalker (Alexander Kaidanovsky) consoles and tells Writer he is so lucky he will live a hundred years, and the latter turns to the camera and murmurs, “yes, but why not forever?” Ultimately, the “Meat Grinder” scene sets a perfect example of Stalker’s consideration and the deconstruction of man as a pointless concept.